The Teeling Whiskey Company has today officially announced the launch of a special commemorative bottling to mark the opening of its new distillery in Dublin. 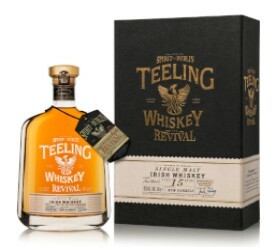 Teeling Revival 15 Year Old Single Malt (46% ABV) was distilled in 1999 and matured exclusively in ex-rum casks. This new release also marks the upgrading of the Teeling Vintage Reserve Collection which consists of limited small batch releases of very old and rare Irish Single Malt whiskeys. Containing some of the oldest Single Malt Irish whiskey ever bottled. The updated Vintage Reserve Collection will comprise three different bottlings ranging in age and price points. The first release being the Revival which will be followed by a 24 Year Old and a 33 Year Old bottling of Irish single malt whiskey. Limited to just 10,000 bottles, Teeling Revival 15 Year Old Single Malt will be available later this month from specialist retailers for a RRP of £85.00.